The seasons are changing and it’s time to dress accordingly. Although there are a few summer trends we can make last all year if we want, a great fall shoe is definitely one thing you want to transition to in September. And what better way to dress up a chic back to school look or even autumn interview attire with than boots, oxfords and loafers? Tall boots, whether they’re casual riding boots or a sexier heeled variety, are a staple in fall each and every year – no matter what’s on the runways and in the magazines at the time. If you live in a rainy region, you’ll probably need two types of tall boots – a casual pair for wearing over denim and cute waterproof ones like these classic Hunter boots. Rain boots aren’t exactly the coziest shoe, but let’s face it – there’s a time to be fashionable and a time to be practical; by investing in both you won’t be caught off guard! Ankle boots are the quintessential transitional shoe. Depending on your personal preference and where you spend most of your days (on your feet or on the go, or in a more conservative office, for example) you’ll probably opt for either a casual or dressier pair. Luckily there’s a big gray area between the two, meaning most booties are super versatile and A-OK for most occasions. I suggest a suede or leather pair with a moderate wedge heel if you want to go from day-to-night without switching shoes. Because there are likely going to be times where you dress up quite a bit, especially later in the season with holiday parties and celebrations, a pump in a fall hue will definitely not go without wear. As much as I’m into the more flashy pastels and prisms in my fashion lately, an autumnal hue never ceases to be warm and sleek all at once. Either of the pumps above can be paired with tights, slacks or dresses should the occasions arise. Lastly, who doesn’t want a casual fall shoe for their day-to-day routine? Boots are lust worthy and all but a pair of flat (or near flat) shoes – anything from ballet flats to oxfords to loafers – is bound to get the most wear. Personally, I like the look of a low-heeled oxford for the perfect autumn day. 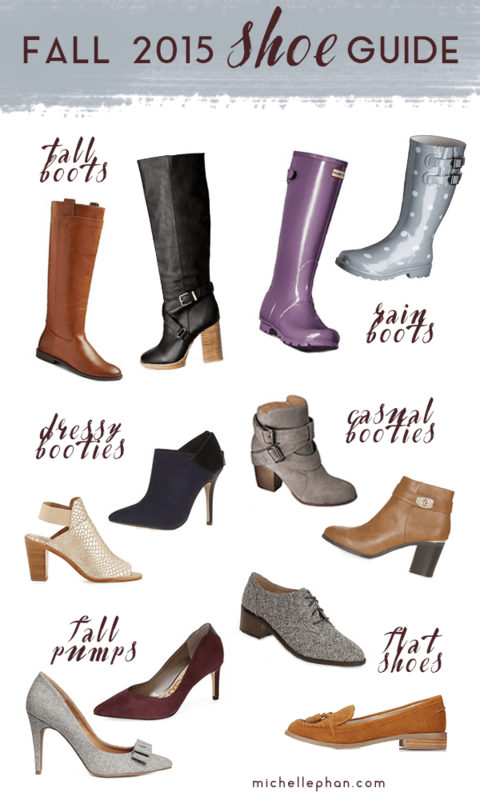 Which type of shoe is at the top of your list this fall? I wanted to share my side of the story to my viewers who has been supporting me since day 1. This video is dedicated to you. Thank you for all your support and inspiration you have given me during my 10 years on YT. I wouldn't be here because of you. 💜 Projects I worked on during the year I was gone. My beauty brand - https://www.emcosmetics.com/ Cruelty Free. Vegan Products. Made in USA My web comic. Free to read - http://www.heliosfemina.com [ I recently made updates to season 1. I added new music for Ch. 1 - 9 ] ♪ music ♫ Kristofferson - "Where Do Tears Go" "Broken Fairy Lullaby" Please support his music! He's an independent artist and creates the most magical songs. ♪ 👇 http://bit.ly/KristoffersonWDTG My IG : https://www.instagram.com/michellephan/ EM IG : https://www.instagram.com/emcosmetics/ credits Artist : https://www.instagram.com/averyota/ Video editor : Me This video is not sponsored.